You don’t need to make the curry paste from scratch - you can use a ready made green or red Thai curry paste. However ready made paste often contains fish so it is not suitable for vegetarians. This recipe however, is suitable for vegetarians and vegans alike. To make the Thai curry paste, blend the ginger, garlic, lemon grass and chilli in a food processor until it becomes a rough paste. For the Thai vegetable curry: Heat the oil in a pan and gently fry the onion for 2 minutes, then add the Thai curry paste and cook for a further 2 minutes; Add the vegetables and the coconut milk and simmer for 15-20 minutes (leave the vegetables that take a short time to cook and add those at the end). Whilst the curry is simmering, cook the Thai fragrant rice: Put the rice in a large pan that has a tight-fitting lid. Add 375ml cold water, the butter and salt. Bring it to the boil, and turn down the heat to a simmer; Cook over a low heat, covered, for 20 minutes or until the rice has absorbed all the liquid (add a little more water if the rice is not tender and all the liquid has been absorbed). 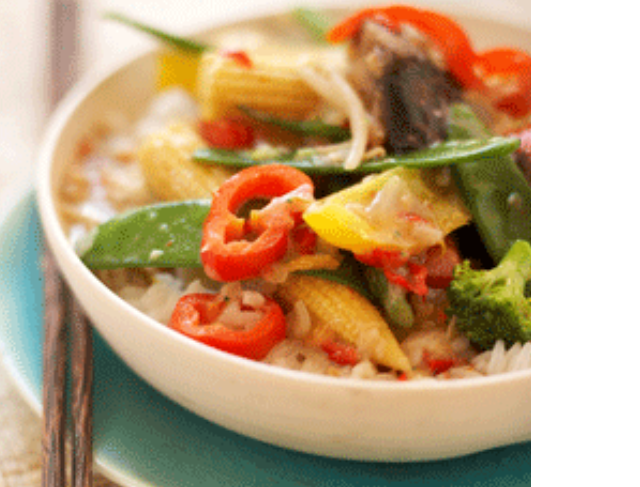 To serve, sprinkle the curry with lemon or lime juice and serve the with Thai fragrant rice.